UPDATE May 13, 2018: It is becoming increasingly important to act quickly if your community wants any measure of local control over commercialized, recreational marijuana establishments. The temptation to ban just retail establishments and to allow cultivation and testing is to be avoided. If it is believed that the sale of this drug is in not keeping with your prevention goals and in conflict with the character of your community, then it is hypocritical to allow it to be grown and taxed in your community and then exported for sale to your neighbors. The pot lobby is actively promoting and over promising possible tax benefits. Oversupply in Oregon has caused a dramatic price collapse. [“How do you move mountains of unwanted weed?”] Taxes are tied to revenue which is tied to price. As prices collapse, so does your tax revenue. Your costs escalate regardless. Your town is likely to get very little in revenue to offset regulation, inspection and enforcement of these establishments, let alone undo ill effects of increased youth and adult use. Where there is more pot, more kids use. Some revenue is not worth taking. UPDATE: April 20, 2018–Added links to public service announcement, parental advisory ad, local town opt-out page. UPDATE: October 31, 2017–Having received an interpretation from Beacon Hill we have updated this post to once again advise that both a General Bylaw and Zoning Bylaw with identical language be voted on by your community’s legislative body. Nowhere in the recreational marijuana law does it explicitly require a Zoning Bylaw as the confirming action of a local legislative body. Therefore a General Bylaw, only requiring a simple majority vote (51%) is believed to be sufficient to confirm a community’s desire to Opt-Out or ban recreational marijuana establishments. Zoning Bylaws require a super majority (2/3 affirmative) vote to pass. It is recommended, out of an abundance of caution, that your community in addition to voting a General Bylaw vote on a Zoning Bylaw (after voting on the General Bylaw). Regardless of the outcome of the vote on the Zoning Bylaw, the General Bylaw is expected to be sufficient to uphold an Opt-Out intention of a community. The law applies differently to each community based on whether that community voted in opposition (No On Q4 Community) or support (Yes on Q4 Community) of ballot Question 4 in November 2016. Communities who voted “No” on Q4 in Nov 2016 have until December 31, 2019 to Opt-Out of recreational marijuana commerce (after that date they must follow the same procedure for Yes on Q4 communities). a vote of the local legislative body to approve a zoning ordinance or bylaw Opting Out. (For example, the City of Lawrence is a No on Q4 Community that has Opted-Out by virtue of a unanimous vote of their City Council). a vote of the local legislative body to approve a general bylaw or ordinance and (optionally) a zoning or bylaw Opting Out. On opting out in a Yes on Q4 Community, the MA Municipal Association opinion of their lawyers is that based on the law (House 3818), passage of a ballot question is only an “enabling” action, that gives authority to the local legislative body to go through the process of adopting a zoning by-law. (1) The city solicitor or town counsel shall prepare a fair and concise summary of the proposed ordinance or by-law which will make clear the number and types of marijuana establishments which will be permitted to operate under the proposed ordinance and by-law and shall be included on the ballot. (3) If the majority of the votes cast in answer to the question are in the affirmative, the city or town may adopt the by-law or ordinance, but if the majority is in the negative, the city or town shall not adopt the by-law or ordinance. 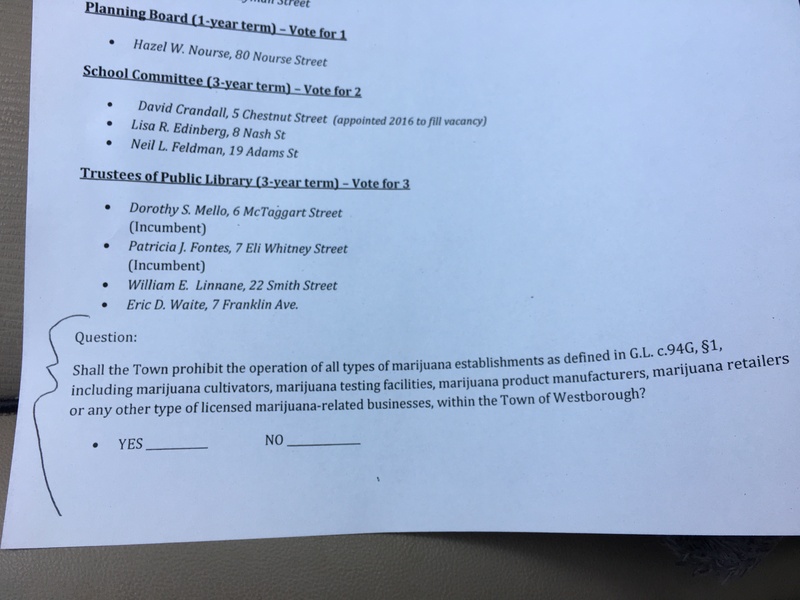 A ballot question under this subsection may be placed on the ballot at a regular or special election held by the city or town by a vote of the board of selectmen or city or town council, with the approval of the mayor, and subject to a municipal charter, if applicable. Step 1: Check this list to find out if your community was one of the 90 “No On Q4 Communities” in November 2016. Follow the requirements for either a “No on Q4” or “Yes on Q4” community listed above. Step 2: Figure out who your local legislative body is: City Council? Town Council? Town Meeting? Step 3: Figure out who puts General Bylaws (usually Selectmen or Council) and Zoning Ordinances or Bylaws (usually Planning Board) on the council agenda or town warrant for a vote. 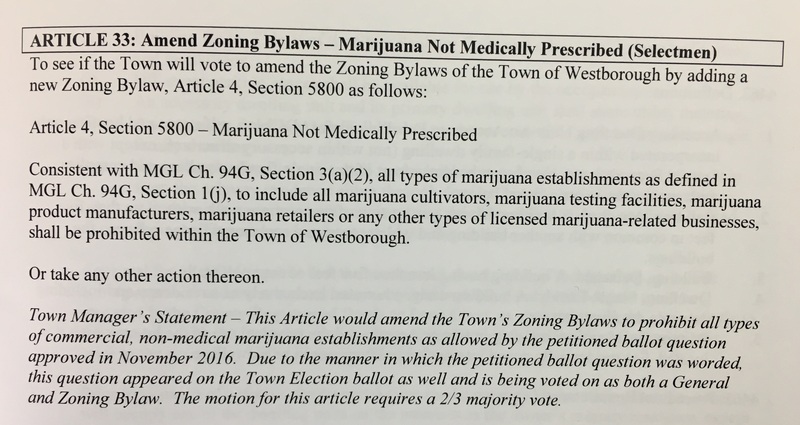 IMPORTANT:*The requirement that a zoning bylaw be adopted by a community’s legislative body is NOT explicitly written in the recreational marijuana law. Therefore a General Bylaw requiring a 51% majority vote should be first on the warrant. The General Bylaw is understood to be sufficient on its own to ban recreational commercial marijuana establishments. As a belt-and-suspenders approach the general bylaw could be followed on the warrant by an identically worded Zoning Bylaw that will require a 2/3 majority vote. include mothers in your community. Your Town or City Counsel (lawyer) may not be up to date on the need and reasons for strong prevention-based policy and may additionally need to be directed to the Mass. Municipal Association for assistance in understanding the legal options available to your community to act. Meet with and educate Counsel on all you are learning about the marijuana industry, THC harms, and the impact of permissive policy on youth and general population use. Remind them of the purpose of zoning–“prevent new development from interfering with existing uses and/or to preserve the “character” of a community.” Remind them of how you see the character of the community. Remind them of their roll as “planners”. This means to act early and out of precaution–rules can be relaxed if the State truly acts to tighten the marijuana law. They are not “reactors”. Potential revenue will be a big driver for this group–Show them the money–some revenue is not worth taking and question it’s value in the context of the total budget and the character of the community. Does not affect Medical Marijuana–only about Commercial Recreational. Does not affect adults rights to use and possess as allowed and limited in the law. Multiple votes may be necessary: 1 at town ballot and 2 at Town Meeting (1 to amend General Bylaws and another to amend Zoning Bylaws). Dedicated Town Meeting Voters–Get list of names and addresses from your Town Clerk records. (Note: you can access the editable PowerPoint files for these postcards here for your use). particularly for families; such as sports activities, religious gatherings, parent pick-up locations, local grocery stores. Advertise event through local media, cable channel, personal email, social media, and posters. Reach out to faith leaders who are very concerned and see first hand the impact of the addiction epidemic on their communities and families. For example, this statement from the Pontifical Academy of Science was shared with faith leaders in Westborough. Consequently they encouraged parishioners to vote on this issue at the local election and Town Meeting. The faith community was instrumental in the successful opt-out effort in the City of Lawrence. This is important: the ballot question is confusing to the voters. Consider Assembling Phone Text Tree: identify those interested in coming to vote at Town Meeting (or to speak in favor of the opt-out vote before City or Town Council) but discouraged by the time commitment and send a text alert as to when the articles will be discussed. Doctors, lawyers, business people, biotech executives, youth and faith leaders, parents of those affected by addiction, just regular parents concerned about trends in our high schools, local law enforcement and local elected officials. Here are the links to Westborough Town Meeting floor action. Article 32 starts in video Part 3 just after 55.00. It continues in video Part 4, with a long technical correction as part of the discussion you can skip ahead to more pro/con testimony. Educational Session Poster: We used this to advertise our informational session at the library. If we were to do it again, I would suggest removing the OptOut email address. Without the email address, the poster stood as purely educational. With the email address, our informational session was viewed as political and limited are advertising options. Flyer in Color: distributed at parent pick-up, shopping areas, sporting events, and to approximately 1000-1200 parishioners at all Catholic masses as permitted. Flyer Front is our information, Flyer Back is an educational piece from SAM. Town Ballot Flyer: We offered this visual reminder (Yes to Opt Out) on voting day; it was helpful for voters to look at, but many didn’t need one in hand. Important point to remember is that any voting materials carried into the voting booth by a voter must be carried out. The Facebook Page: Initially, our approach was more stealth and controlled, trying to mobilize our dedicated voters (routine voters identified from town records) while not riling our opponents. Postcards and emails were our prime means of communication. Once we saw the right type of interest, and with only four days before the election, we decided to use Facebook to spread the message further. We still chose to pass the message through acquaintances, rather than a general broadcast. A group member developed the page and brought a large group of her followers. The facebook flyer was the original posting, followed by periodic postings of new research or vote education material. It served as an excellent two-way communication tool. Below is an example of an EMAIL; the EMAIL corresponded to the POSTCARD mailings. Emails were directed to our individual social circles. Before sending, emails were tested to be sure they were mobile-phone friendly. Messaging and word placement could be tricky. VOTE YES to keep them out? Think of it…Retail pot shops with attractive, toxic, high-potency THC candies, drinks and food available for accidental ingestion by our children. 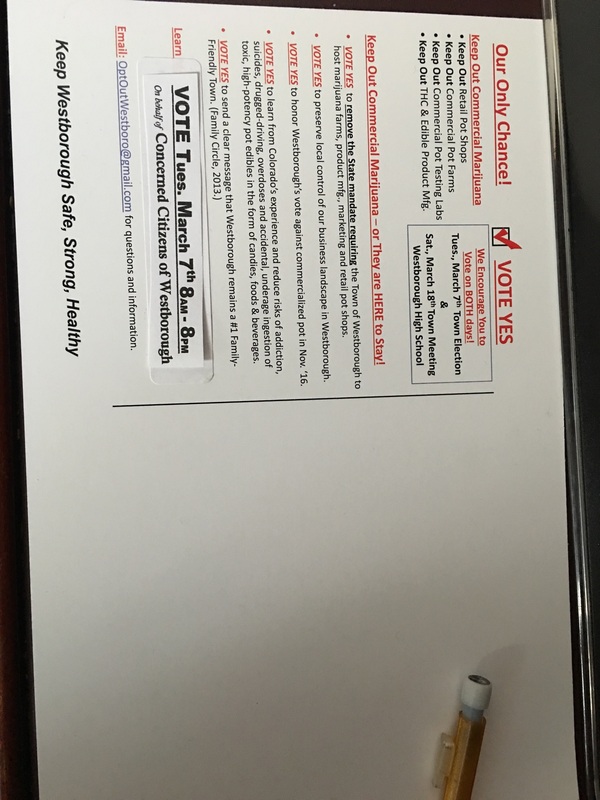 This is Westborough’s ONLY CHANCE to keep out commercial marijuana businesses from operating and expanding in our town. VOTE YES – Keep Out Commercial Marijuana – or They Are HERE to Stay and Grow! 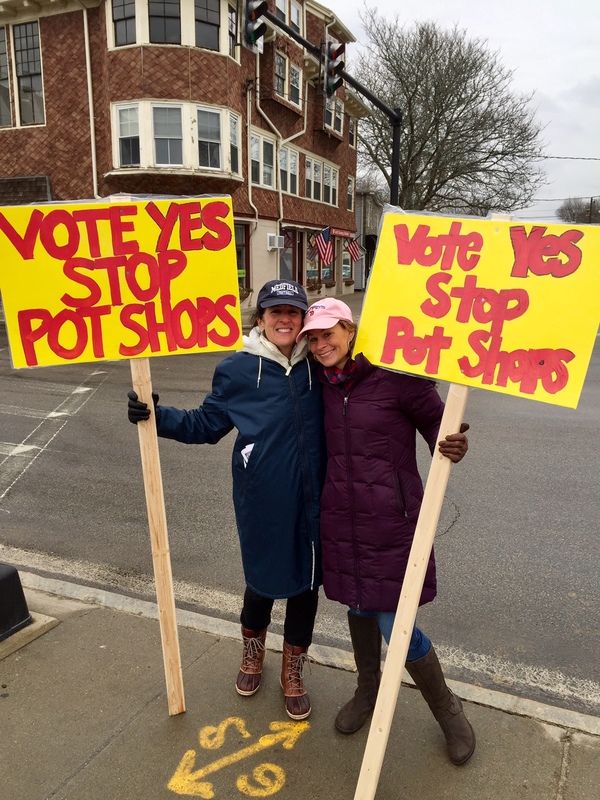 VOTE YES to remove the State mandate requiring the Town of Westborough to host marijuana farms, product mfg., marketing and retail pot shops. VOTE YES to preserve local control of our business landscape in Westborough. There is no upper limit to the number of businesses. 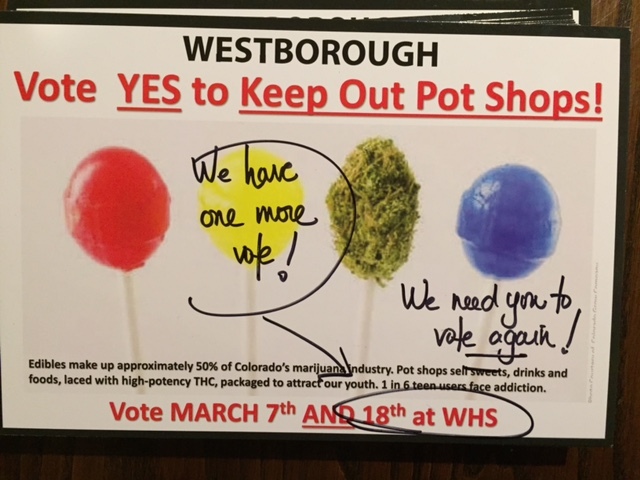 VOTE YES to honor Westborough’s vote against commercialized pot in Nov. ‘16. VOTE YES to learn from Colorado’s experience and reduce risks of addiction, suicides, drugged-driving, overdoses and accidental, underage ingestion of toxic, high-potency pot edibles in the form of candies, foods & beverages. Voting takes place at Westborough High School. Email: OptOutWestboro@gmail.com for questions and information. Share: Share this email and resources widely with family, friends and social media contacts! Thank You for Keeping Westborough Safe, Strong and Healthy! Another example of an EMAIL. Here we incorporated the ballot language, which we thought was key. We were asking the voters to come out to vote on two separate occasions and the ballot question was counter intuitive. It was a lot of information to digest. Thanks to all who came to our Commercialization of Marijuana Info Session and heard the insights of State Representative Hannah Kane; Stephanie Hubbard, former Colorado resident; Jody Hensley, community advocate; and commentary from health care professionals and policy advocates on the new Massachusetts Marijuana Law and its effects on the citizens of Westborough. Attendees were shocked to learn the predatory tactics of this “addiction-for-profit” industry and the real risks to our community. 1. VOTE YES and BRING YOUR FRIENDS! Thank you for your interest and support… and mostly, for your YES vote on March 7th and March 18th! And thank you for doing all you can do to keep Westborough safe, strong and healthy! p.s. Can you help pass out flyers? Please reply OptOutWestboro@gmail.com if you can help us! p.s.s. If at any time you wish to “opt out” of these emails, I am happy to accommodate! Thank you so very much!